Look closely at how you choose to create your current pathway and how you intend to perpetuate it to reach your goal. Know when it's time to stop, when to persist when you need to and to allow room for changes and exchange of energies. In this case, elk symbolism signifies that you are entering a time of plenty. In other words, everything you need you will get. Alternatively, elk meaning suggests that you don’t try for the quick and easy. Therefore, long and steady progress is the key to reaching your goals. Similar to the terrier dogs, the Wapiti also brings you courage and perseverance in achieving your goals. Sometimes all it takes is the next step. This large member of the deer family is also bringing your awareness to competition. Are engaging in something competitively rather than working within the group to reach a common goal? Another aspect of elk symbolism could be strength and empowerment. If you need to be impressive in a situation, you can draw on its power. Like the skunk, if you are shy or unsure, Wapiti can aid you to become more confident. People with the elk totem know how to pace themselves. They may not be the first to arrive, but they will get there without burning out. Like the horse, folks with this spirit animal will often feel the need for companionship or group support. They understand that they do not have to do everything alone, and that help is out there waiting for them. All they have to do is ask for it. Also, people with this totem need high energy levels. The best way for them to accomplish this is through the foods they eat. Therefore, people with the wapiti totem will benefit from a diet that is mostly vegetarian. In fact, this type of diet will give them strength without stress. Vitamins are also an excellent supplement for them. If you have an elk dream when you are beginning or starting a new project, they have arrived to guide you. In this case, this relative of the moose’s message is apparent, and they will also and give you the strength and perseverance to complete the job. The vision can also be an indication that you need to spend more time with friends and eat healthier. If you find yourself communicating with one of these creatures, then positive changes are afoot. I was camping w a bunch of fri nds n took a bunch a shrooms. I was tripping so hard I laid in my blue tent for 4 hours thinking I was floating along a river stream. I guess I was in a deep meditative state n I stared thinking bout this big animal that was deer like but I knew what it was but didn’t know the name. after I’m done the trip I ask my homies( what’s that animal that looks like a deer but it’s big) we started naming all sorts of stuff then someone said elk. I said hmm I think that’s what it is. We emended up leaving the campsite a few hrs later and on our drive back we freaking see an elk in the middle of the road. It literally just starred at us for 2mins then went jumping into the woods. I love the symbolism of this because I believe this is exactly what I need. The universe makes no mistakes!!! I had a dream my sister and I were riding down a snowy road and saw elks with their antlers stuck in the snow, dying and then we went back and they were frozen and dead and one was alive and moved but was frozen. They were in a row, one side of their bodies frozen and antlers sticking up. Anyone have an idea of what this means? Last night during sleep an enormous male elk with a giant rack appeared and just stood in silhouette for a long time while I examined him. Nothing more. I live in Colorado so I see elk all the time. I have never dreamt of one before. It was such a sustained image that I feel I have to pay attention to it. Elk, Atená:ti, speaks of love, particularly the love of friends and of community. We all belong to something, to some group, whether we know it or not. We are part of a Tribe which is a part of many Tribes and in the way that Great Peacemaker taught the Haunenosaunee Nations, a single arrow is easily broken, but a bundle of arrows, united together are much stronger than any single one. So it is for us as human beings. So it is for us as beings of the earth. And so it is for us as beings of the Universe. When we know ourselves as one small part of the whole we are stronger and we know that we are loved. Atená:ti reminds us that when we feel ourselves as part of the whole rather than seeing only through the eye of the Ego, as apart and separate, do we know the great Love that is all of being. I’m 13 FYI. I was on a family trip and we were hiking up a steep hill and I wandered of and I came up to a little rock ledge on the hill and I started pushing the rocks down. But I lost my footing and tumbled down and when I got the bottom of the hill I had landed smack dab in the middle of 4 elks 2 does one white/grey male elk with great shining white antlers and one baby elk. They got scared and ran past me the male elk though had bounded over me in one great stride an as if in slow motion the elk looked down at me midway over me and then he landed with such grace he was able to swiftly run off as if steam dissapating in the morning dew. White Elk is my Birth Animal , and White Deer and White Tiger are working with me @this Time as well! Thank you for Sharing! I have a birthmark on my left leg that is in the shape of an “elk sedge” I looked up what that was and was fascinated that it it represented divine blessings and protection. I know that many are blessed with having many different spirit animals. I believe the elk is one of them! How marvelous! I had a dream last night. I was driving up a hill and when I reached the top, I saw a brilliant blue lake with majestic snow covered mountains behind the lake and trees to each side. I stopped my vehicle and wished I had a camera and then, right before my eyes, a very large elk with huge antlers galloped up the snow covered mountain in a diagonal fashion. The elk seemed to be white or grey, but maybe covered with snow? I felt really happy and mesmerized by what I had seen and couldn’t wait to tell all to my family. What a great dream! What a beautiful dream! I hope like the elk you are living life at your own pace! Perhaps you’re overwhelmed in life and you worry for you’re family. Instead of taking a breather and allowing yourself to regain your strength. Maybe you desire to join a more positive herd? Last night I dreamed I was walking side by side with a giant female elk like we were friends. I had my hand on her shoulder as we walked. I felt very safe and comfortable with her. Labor day weekend I had a bull elk come into my yard that was tangled in a tire swing. There was a log on one side and a tire on the other side of his face. He kept getting hit in the face with the log and was in distress. After hitting multiple roadblocks in trying to get help for him, I decided I had to help him myself. I am a small animal veterinarian and have a very special bond with animals, but this unlike any animal I had ever helped before. I didn’t have the luxury of a tranquilizer gun so had to rely on corn, pruners and prayers. I was able to cut the swing off his antlers over a 12 hour period by just talking to him in a very calm quite voice. It was a true miracle!!! I have been criticized that I could have been severely injured or killed, but I was never scared. I knew he trusted that I would help him. The story made national and international news. The most accurate story is the one that ran on the Phoenix, AZ news. Google “Elk, AZ, Vet” and watch the AZ family story to see the miracle. He has come back to visit a few times, but I haven’t seen him in the past few weeks. It’s hunting season so I hope he’s just hiding. Make that a bull elk jump out in front of me on 2 separate occasions in two different states. while hiking in the Colorado Mountains and again in the Big horn mountains in Wyoming I had an elk jump over my path right in front of me. I am thinking that is some kind of sign! i saw an elk symbol in a water drop today, it fell in front of me today and made the elk body and antlers i live in the dessert so i never see them, i believe it was not a thing i can imagine quickly or easily. if possible info me. oi was so clear of what it was, not like clouds with “shapes”, the water drop fell from my hair after it got wet and the only water drop around that i can remember from me, it was just an interesting experience and filling after. I actually grew up on an elk farm so seeing elk in my dreams is always nice. But my dream was long and the whole dream was based on structure and family and with one of the “clips” I dreamt I was in the pasture watching a Peacock from a distance with my dad and from over the hill comes an elk chasing a Peacock towards me but I didn’t have enough time to jump the fence cause I thought it was charging at me but it ran past me twice. 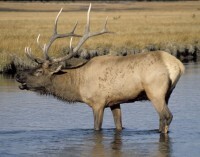 I dreamed a few days ago about finding an elk frozen in a lake. I got closer to take a picture and the closer I got, the more it defrosted. When it was unfrozen, it turned and attacked me. I was forced to climb a large rock and then I was trapped by the charging elk. I had no where to go so I jumped and died. It has been bothering me for a long time but I’m not sure what it means. Any advice? Today I felt, and then saw a great elk during an entire session of guided meditation. He felt primordial and to be honest a little frightening. I don’t think he wasn’t there to put me in harm’s way, but he wasn’t there to keep me safe either. I directly looked at him once, but felt him constantly. There were times I saw him, but didn’t do so visually. I’m sorry it’s hard to explain. I felt like there was something he wanted me to do, and when I think I found it, it terrified me. As much as I was terrified of him, I think he wouldn’t hurt me. This is the first time I’ve ever seen any creature or anyone, during guided meditation. He was really large, and I always felt his gaze. Can anyone help me understand this a bit better? I would love any help with a specific vision encounter I had with an elk. It was unique in that it was all black. From hoof to tip of its antlers it was black. There was a grayish to the neck, but with kind and familiar eyes. It allowed me to hug and lay with it in a field and then trotted ahead of me on a journey to meet another guide. i cannot find anything anywhere on the meaning behind a specifically black elk. I would appreciate any information you may have. This book is about the wisdom and life of a Great Medicine Man, Shaman, North American Indian Chief, and his name is Black Elk. Thank you. Im still in shock. But I know im ready. …..im sorry for everything ive done but I know it happened for a reason. I wouldnt change anything even if I had to do it over again. This is what was supposed to happen. I love you and thank you. I did see the elks and everything else. Thank your secret is safe. My word is good as gold but only to the right people.